During Western Expansion, several things happened to American society. 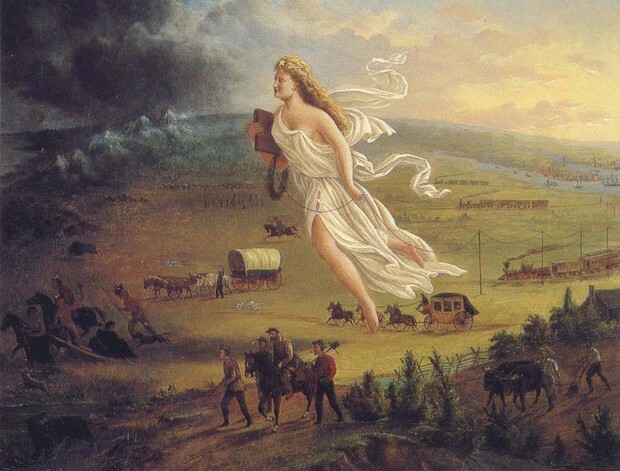 First of all, they developed a general concept of "manifest destiny", a term coined by journalist John O'Sullivan meaning that Americans and American culture was superior and had been given the right by God to bestow their culture and ways upon "less civilized societies". Second, religion spread across the country. As people moved, they brought their religion with them. Some Indians even converted. This resulted in the Great Awakening. People of the time were very religious and lived by the Bible. Finally, people moved west. Indians were moved into reservations as the Americans moved across the land, taking their culture and their ways of life with them. Settlers built homes and plantations, and took over Indian land. Essentially, Western Expansion was a time of population growth and spreading across the continent. During Western Expansion, especially in the South, the cotton gin became extremely popular with new and old plantations. Plantations, essentially mega-farms, worked using hundreds, even thousands of slaves. They could produce millions of pounds of cotton and cotton became a major crop in the South. (see "Technological Innovations" for more information on the cotton gin and it's relation to the cotton industry.) Plantations also became extremely popular. Many plantation owners were outrageously rich, and were very important in society. Also, in Georgia, the state capitol was influenced by where the major trading centers were and where things were centrally located. Politics in America during Western Expansion were extremely chaotic. The political relationship between the US and the Indians were pretty bad in particular. On the America vs Indian political front, America was trying to push the Indians out of their ancient lands so that settlers could take over. 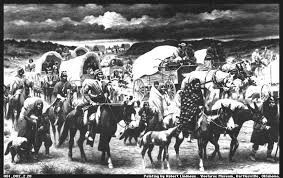 Andrew Jackson even ignored a Supreme Court ruling on whether the Cherokee Indians could keep their rightful land, enacting the Indian Removal Act of 1830, which resulted in the Trail of Tears. William McIntosh sold his tribe's land to the government, and was killed by his own people. Much of this political chaos was caused by the land lotteries and general sale and possession of land. The land lotteries were just big giveaways of land where men could enter their names for a chance to win a certain plot of land to do whatever they wished with. This meant moving in or close to Indian territory, which caused much tension. The Yazoo Land Fraud was also notable. Several companies bought land off of Georgia, and when the public found out, they protested, The federal government paid Georgia $1,250,000 and gave back the land, They also promised to remove the Indians, resulting in the aforementioned conflict. In other words, Western Expansion wreaked absolute havoc on politics. Not that they weren't already crazy. Western Expansion brought around many technological innovations. Among them were the cotton gin (invented by Eli Whitney) and the cross-country railroads. The railroad worked hand in hand with the cotton gin and the cotton industry. It made transportation of cotton easier and also helped speed how fast the South and North could make money from each other's relative industries. So, the Westward Expansion period was also a time of great technological innovation in America.